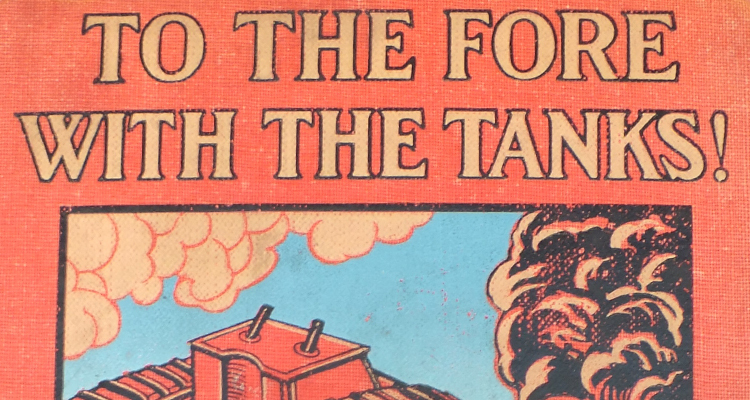 Tanks in the First World War were very slow. There were no tank transporters so tanks had to go by train and, as the war went on, they were getting bigger and heavier. 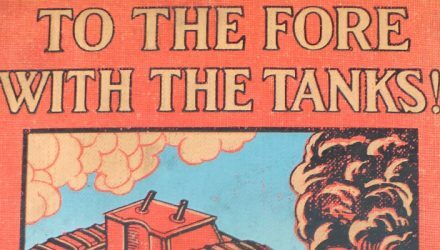 These images display the journey of a tank via train, from the wagon used to the train ferry to France. 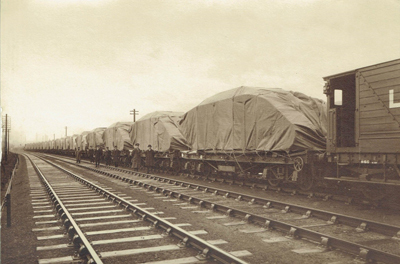 Photographs courtesy of the Midland Railway Study Centre and The Tank Museum. 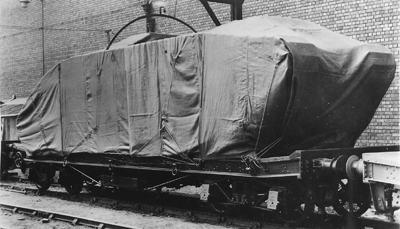 The Rectank was designed by the Railway Executive Committee hence its name, and was built in railway workshops all over Britain. It can be identified by the screw down jacks. There are two at each end and four more in the middle, to support it when it’s loading. The header image shows a female machine (No. 9766) is shown boarding a Rectank wagon at the factory in Birmingham. The Petty Officer is a reminder that all tank handling in Britain was done by No.20 Squadron, Royal Naval Air Service. The wagon shown was built by the Midland Railway at their Derby Works. 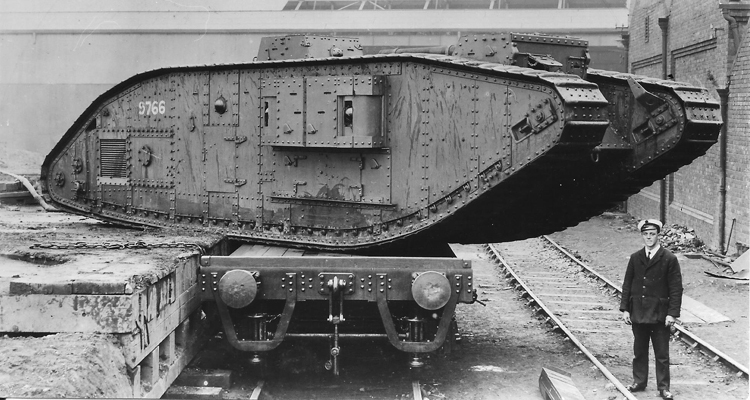 The tank most commonly carried in 1918 was the Mark V*, which weighed about 35 tons. The tank is now wrapped and ready to go, notice it is underneath a loading gauge to check that it is not an outsize load. 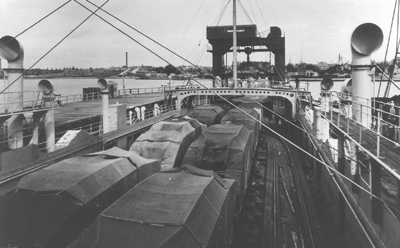 Here the tanks have been marshalled into a train, the guard’s van on the right belongs to the London and North Western Railway. The tanks will now be delivered to Newbury in Berkshire, the main Tank Corps depot in Britain where they will be prepared for service in France. From Newbury they will be sent to Richborough in Kent and loaded onto a Train Ferry that takes them over to Calais. 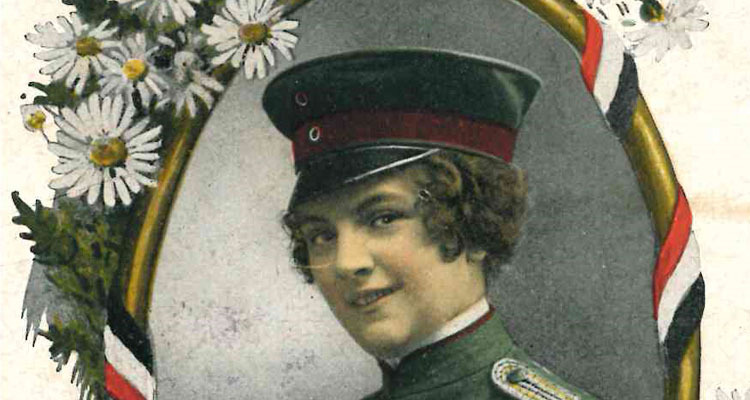 Then they will be issued to Battalions for active service on the Western Front. Thank you for a very interesting selection of pictures. Rather scary that the tank is being loaded on a diagonal without the jacks being deployed – not sure I would have wanted to stand where the RNAS man is. Also of note is that the sponsons have been removed in the shot taken under the loading gauge – around 9′ to 9’6” is the standard width that can be accommodated in the UK .